Computers apparently take the fun out of everything. That seems to be the message that we get from motoring programmes because invariably when they are testing a car around a track the presenters turn off the computer aided traction control systems. This is followed by lots of tyre smoke, high-speed cornering, power slides and whoops of delight. I am not sure what it says about me but I have a traction control system on my car and I am terrified that the idea of turning it off. I am blessed by the cruise control however. Computers are also very good at flying aeroplanes. Autopilots enable an aeroplane to fly on a predetermined course and altitude without deviation, and auto land systems can even land an aeroplane successfully. I am glad that these systems exist on passenger aircraft but they would be no good for the Red Arrows! and they cannot adapt to emergency situations. When US Airways flight 1549 struck a flock of Canada geese and needed to make an emergency landing it needed the skill and experience of Captain Chesley B. 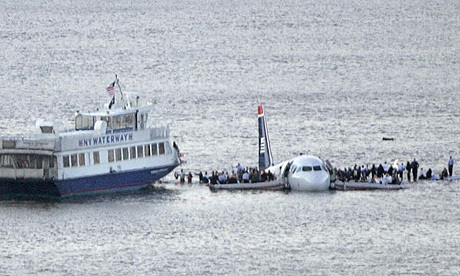 “Sully” Sullenberger to land it spectacularly on the Hudson River enabling all 155 occupants to evacuate safely. This morning I am preparing the next session in our “Expedition Through the Bible” course that I am leading at our church. This week we are looking at how we interpret what we read and is part of it I will be explaining how I prepare a sermon. The process of trying to explain the process of sermon preparation has made me realise that when I approach a passage I am on autopilot: my preparation processes happen automatically and without me thinking too much about them. That does not make it a fair process, any more than the ability to drive without having to think too much about what you are doing makes that bad. But it has been helpful for me just to pause and reflect on the process that I go through in order to try and ensure that I am not relying solely on a tried and tested routine and excluding God from some aspects of that preparation. I guess that same principle applies to all aspects of our lives. Something is we do automatically, without thinking about it, without involving God and it. It is worth pausing sometimes and reflecting on how we are living to make sure that we are not excluding God from any aspect of our lives. And yet when we pause and reflect we will find that involving God makes a difference. It is like turning off the traction control system on a car or the autopilot on an aeroplane. Suddenly it is a little bit riskier, a little bit more dangerous, more faith filled, less conventional. But instead of us being behind the wheel or the yoke we relinquish control to God and strap ourselves in beside him! Next Next post: wise words?